WHAT IS THE HUMAN ENERGY FIELD? The energy field around your body contains your aura, your colors flowing from the center of your being. Aura Imaging Photography takes a snapshot photo of your colors in the moment. The colors reflect the emotional and mental characteristics of your personality. By reading the aura, you can gain new insights about your challenges and your gifts. “Aura” photography does not go against or favor any one particular religion or faith. As with any alternative or complementary practice, aura photography focuses and benefits a person on an individual level. The purpose of which is to gain new insight into your natural talents, as well as your emotional, spiritual and physical health as it pertains to your unique self. The biofeedback sensor or “hand plate” measures the electronic potential emanating from the meridian points along the palm of your hand. Once this information is captured it is displayed visually and is further broken down into graphs for your convenience. The human energy system consists mainly of seven major energy points (known as chakras) located along the spine; the root, sacral , solar plexus, heart , throat , brow, and crown chakra. Each center influences a different area of the body. The energy from these points is what healers utilize in most major forms of energy therapy. Depending on the origin of the technique used, energy therapists may call this energy by different names. However, they are all referring to the same force. When the chakra system is out of balance it may cause some people discomfort. The main purpose of most energy healing techniques is to restore the balance within each energy point with the goal of reducing stress, restoring energy and alleviating physical pain etc. 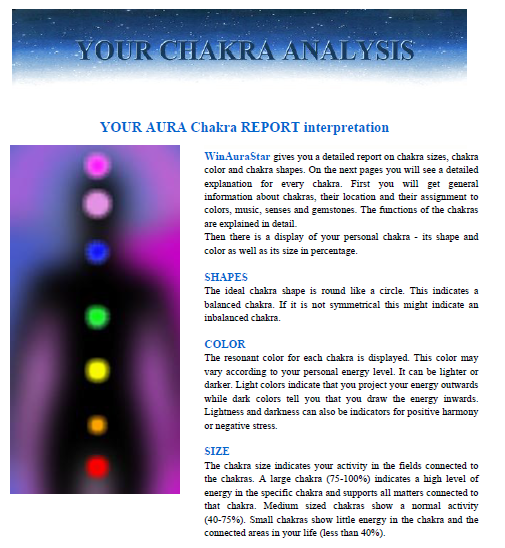 The chakra analysis includes detailed descriptions of the energy centers and their functions. Your chakra system is shown on a full body image that includes your entire biofield. The percentage of which your major energy centers are active is measured reflected in bar graphs. An energy healer may use this information to identify areas of imbalance faster than usual, allowing more time to focus on healing. Information gathered with consistent biofeedback photography can be very valuable when monitoring energy levels. It is often used by energy healers and within the various fields of holistic health. Providing customers with these visual aids helps create a better understanding of the human biofield and how energy can impact us. Biofeedback photography is particularly useful for tailoring sessions on an individual level as well as track the changes in your energy levels before and after participating in any energy balancing practices. HOW FREQUENTLY SHOULD I MONITOR MY AURA THROUGH AURA PHOTOGRAPHY? It’s good to keep track of your health and personal well-being. For many of us, this means monitoring ourselves on a regular basis and/or taking part in regular beneficial activities; e.g. regular exercise, massage, maybe even something as simple as a new haircut. Biofeedback photography is no different and it is most beneficial when done on a regular basis. Often times we don’t give our energetic bodies or inner self the attention it requires. This may leave a person feeling out of balance, unfulfilled, or unhappy… Learning about our Aura energy is a great way to get in tune and listen to your body. 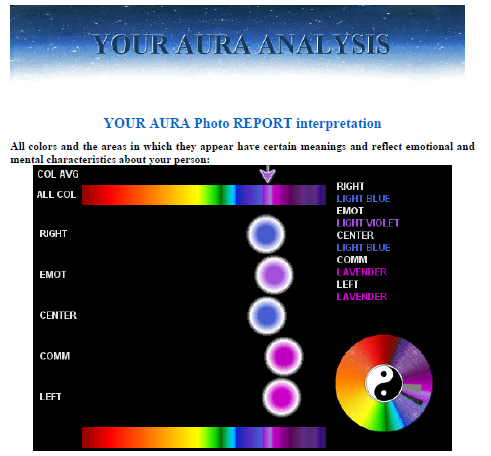 It is recommended that you monitor your energy levels through Aura photography at least once every 2 to 3 months, especially during times of significant change in your life or when undergoing any type of alternative health practices. See how your chakras change when you have a session of Reiki. Jessica will do 1 aura photo before you have a 15 minute session of Reiki and then do another aura photo. She will then go over what the photos show with you. Reiki is a great way to balance your Chakras. We will be scheduling this service as a special event. Please watch for it on our Special Event page and in our Facebook events. This is a system of energy healing focusing on your chakras. Energy is pushed and pulled to realign your energy centers and get good energy flowing. During a Reiki session, our providers can discuss with you what you need to work on and how you can help heal yourself. Chakra balancing is done intuitively.